Okay. So the blog title, Born again Swindonian, gives the impression that I was born in Swindon, left and returned in later years. Hence ‘Born again’. That’s not the case but it’s the best I can come up with that remotely suits my position. I moved to Swindon from a northerly part of the country about 20 years ago. Swindon is now definitely home and I’ve grown very fond of the place. I’ve begun this Swindon blog to celebrate many of the good things about it. No it’s not perfect. No it’s not Bristol or Bath or Cheltenham or any of those wonderful places. But not everywhere can be. And for all its faults it’s not terrible either. There are a lot of worse places one could be than here. Yes, any interesting buildings that might once have existed in the town centre have been replaced by concrete blocks. But that’s true of every town centre in the land. Despite all of these things Swindon is anything but soulless. Beneath a sometimes uninspiring exterior there is most definitely a healthy heart of art and culture and parks and green spaces and good food and of course its rich railway heritage! So tiring of all the,’the best thing about Swindon, is the train pulling out of it’ cracks I thought I’d try and redress the balance a bit. And anyway, given the extortionate cost of a train ticket to and from Swindon thanks to the greed of FGW, how can that statement even be true? Hi There! My name is Ed. 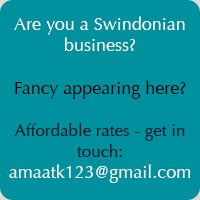 I was wondering if you would be inclined to share one of your Swindonian Coffee Stories on a new blog that I am starting? I would love a story about a cafe in your area of England. Let me know if you would be interested in sharing! We’ve been here 10 years this year and I agree – it’s a great place. So much to do here – just have to find it and get out there. My social life has never been better; met some great people, made some wonderful friends; and with both our businesses running from Swindon; our network and knowledge of the area keeps growing. What a love the most is the vast choice of great pubs we have access to and the wonderful countryside surrounding this town. I am a Swindonian .i did leave for a while in the 90’s this only made me love my home town more. (theirs nothing like a dirty city to make you home sick) I have a small family business here, we could have gone to Bath,Bristol or such like but no we wanted to inject a little culture into our home town, the journey has been eventful but the people we meet and the little treasures we find in our quest for all things vintage make it the best move we ever made . Tracy, great to hear from you on here. And well done on bringing your venture to Swindon. It’s just this sort of thing that I want to show on the blog: that beneath a rather dispiriting exterior there is so much to celebrate in the town. Good luck! Swindon has some great cycle routes too. It is on Sustrans Route 45 which goes from Salisbury right up to Chester. It is also surrounded by by some wonderful countryside and only and hours trainride from London [ if you an afford the fare] What’s not to like? Great to see someone extolling Swindon’s virtues! !